iPresort » Christmas cards are in the mail. Christmas cards are in the mail. It’s the time of year when business picks up at the post office as people across the country get into the holiday spirit. There are gifts and packages to ship, and about 1.9 billion Christmas cards to send. Greeting cards have actually been around for most of recorded history, going back to ancient China. Europeans were giving greeting cards back in the 1400s. But those early cards were hand-made and hand-delivered. The greeting card as we know it today, commercially made and sent through the mail, did not arrive until the invention of the postage stamp revolutionized mail systems. Modern commercially printed Christmas cards first appeared in Britain, in 1843, just three years after the introduction of the Penny Black stamp. Back then, the cards usually did not feature winter scenes, but often had fairly elaborate spring-themed pictures. The mails were rapidly becoming inexpensive, efficient and reliable, and the industrial revolution caused the migration of millions of people who were looking to work in the manufacturing centers. As these trends progressed, so did the popularity of sending Christmas cards. 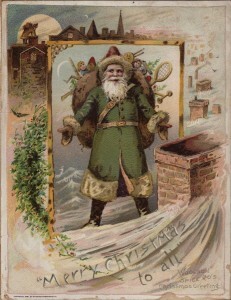 The idea of commercially printed Christmas cards reached America in 1875. Their popularity waned when the USPS gave up its monopoly on printed postcards in 1898, but resurged in the 1920s and has continued to the present day. The success of those early commercial Christmas cards contributed to the success of modernized postal systems through a drastic increase in mail volume. It also inspired an entire greeting-card industry, with cards for nearly every holiday, birthday or occasion. Yet even today, more Christmas cards are sent than any other type of greeting card. Filed under: iPresort / Total Fulfillment, Pop Culture, Postal History by Shaun Swegman Jr.